A psychoactive substance is a substance which is capable of producing a psychoactive effect in a person who consumes it and is not an exempted substance. A substance causes a psychoactive effect in a person if, by stimulating or depressing the person’s central nervous system, it affects the person’s mental functioning or emotional state. 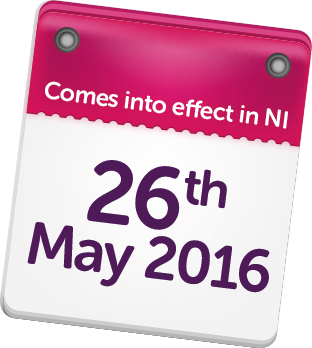 Exempted substances include alcohol, tobacco and nicotine, medicines, caffeine and foodstuffs. The law will be supported by a thorough system of testing in order to show that a substance is capable of having a psychoactive effect, (this can then be used by the police and/or the courts to pursue prosecutions). If you break the law – you can be jailed for UP TO 7 YEARS. Police can seize and destroy NPS. They can search people, premises and vehicles. Whilst personal possession isn’t covered under the ACT it will be up to the police and courts to decide the quantifiable difference between personal possession and possession with intent to supply. 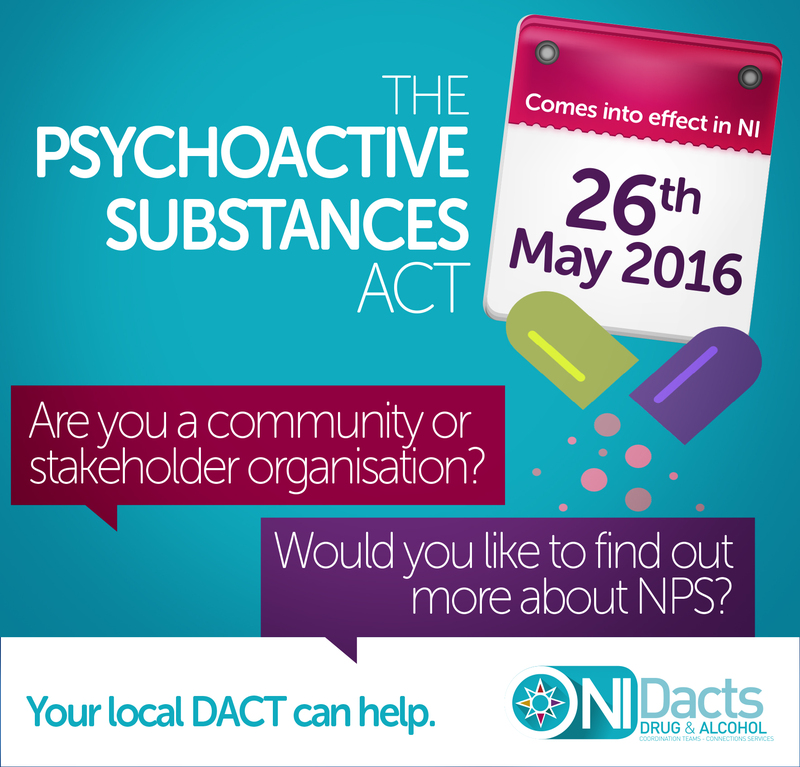 NPS AREN’T SAFE – 144 deaths in the UK in 2014 were linked to NPS use. Risks of using/consuming NPS can include reduced inhibitions, drowsiness, excited or paranoid states, coma, seizures, and death. These risks are significantly increased if you mix NPS with other types of NPS, alcohol and/or other illegal or prescribed drugs. In essence if you choose to take them you are being the guinea pig – many are so ‘new’ that there has been little to no research carried out into their side effects – in the short term or long term. Help and support is available – visit the ‘Services Near You’ section. 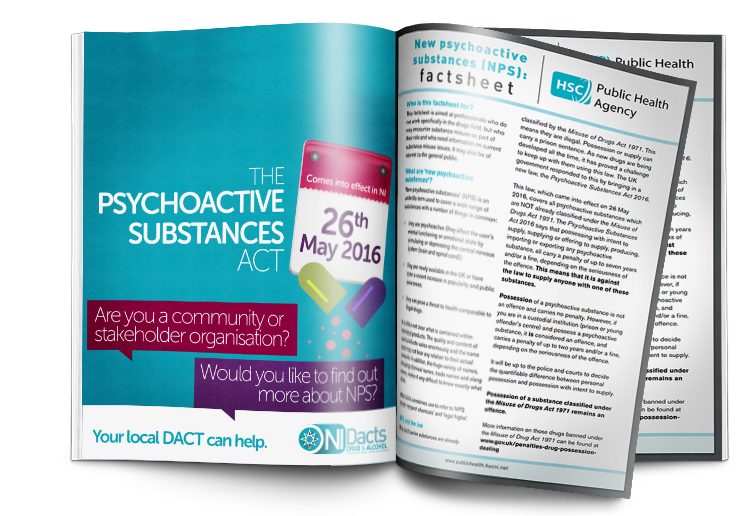 If you are a community group or stakeholder organisation who would like to find out more about NPS please contact your local DACT Connections Service – visit the ‘Contact Us’ section.